The key to making a delicious, beautiful, crowd-pleasing Thanksgiving meal is not Michelin chef-worthy skills– it’s smart planning. Sure, knowing your way around the kitchen helps, but mapping out your plan and making a list or two helps more. Reliable recipes are also essential: don’t bet your turkey on an Instagrammer with 100k followers who can take a mean picture but doesn’t know the safe internal temperature for your bird. Most of all, have a plan for that last half hour before you serve. That is when you want to ensure everything is heated up but not overcooked; warmed but not dried out. All of your planning is to ensure that last half hour is a simple and seamless as possible. First, list out the dishes you are thinking of making. Next to each one, mark those that require last minute oven time versus those that require the stove or microwave. Count on dishes that can be made in advance. Nearly every iteration of white and sweet potatoes, stuffing, roasted vegetables, steamed vegetables, squash, cornbread, cranberry sauce and desserts can be made in advance and reheated or brought to room temperature for serving. The key is knowing how to best reheat them. More details on that are below. Plan for oven space When you take your turkey out, you have about 30 minutes of resting time before it should be sliced. During that time, you can reheat in your oven. But your oven can only fit so much, so be sure you don’t have to reheat more than will fit. In fact, it is a good idea to think about the vessel in which you will bake and reheat each item, and actually place those empty baking dishes in the oven. Do they all fit at once? If not, re-jigger the menu with fewer casserole-style dishes and more that can heat in a skillet just before serving. Embrace your microwave When planning your menu, bear in mind that some dishes reheat really well in the microwave. Case in point: place Crisp vegetables, such as green beans, in a pie dish (or shallow bowl) in the microwave with a sprinkling of water. You’ll not only retain the texture, but also more of the nutrients. Omit the water if you can toss them with their dressing (such as a vinaigrette) or sauce first. Simple mashed sweet or white potatoes may also be reheated in the microwave: stir in a little liquid first, and stir the potatoes once or twice as they heat up. If you have the space on your stove, I think it is a little easier– mostly because you are already standing right there so an occasional stir doesn’t take you away from anything else. Don’t heat biscuits or breads in the microwave: it makes them tough. Roasted vegetables will lose their appealing texture when reheated in the microwave: they’re better off on a sheet pan in the oven. Stuffing: Many stuffings will benefit from the addition of a small amount of liquid before reheating. Prick the stuffing all over with a fork and sprinkle it with a little broth. The broth should seep down into the stuffing where you pricked it. You can put it in uncovered (because who doesn’t love those crisped bits on top! ), but if it gets too brown, place a sheet of foil over the top. Here are some stuffings we’ve created: Sourdough, Cranberry and Chorizo Stuffing, Cheddar Biscuit and Sausage Stuffing, Whole Wheat, Fennel, Sun Dried Tomato and Basil Stuffing, Wild Mushroom, Sausage, Apple and Kale Stuffing and Cornbread, Cherry and Bacon Stuffing. 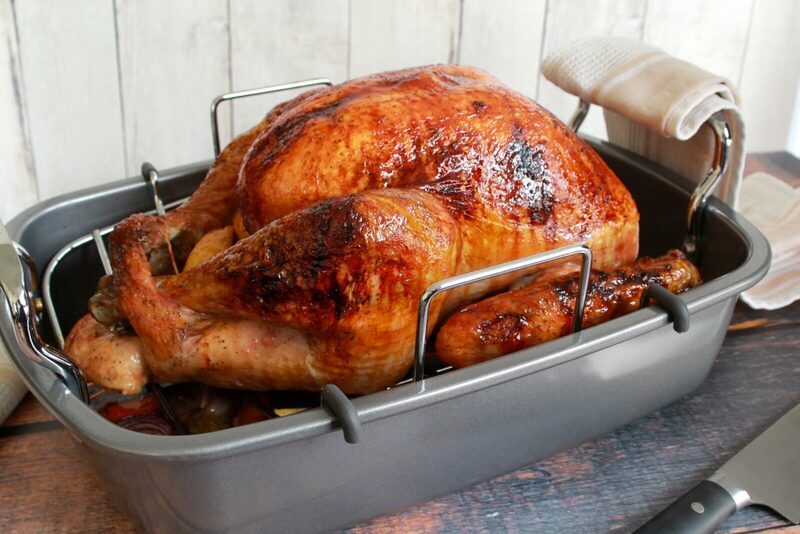 Turkey: The turkey needs to rest for at least 30 minutes before carving (larger turkeys can rest for 45 minutes)– I promise you it will stay steaming hot until you slice it. It is a common practice to drape the roasted turkey with foil when it comes out of the oven: I believe people do this thinking it will stay warm. In truth, all you are doing is steaming– and by that, I mean de-crisping–that beautiful golden skin. Again: the turkey will be piping hot when you cut into it after resting uncovered for 30 minutes. Here is everything you need to know about turkey, from cooking methods: how to wet and dry brine, spatchcock, and roast , to an illustrated guide to taking the turkey’s temperature, to how to carve the turkey. Roasted Vegetables: Initially, you should slightly undercook roasted Brussels Sprouts or cauliflower (or any vegetable that you want to serve crisp-tender). Cook them until they are somewhat browned, but still fairly crisp. This is best achieved in an oven at a fairly high temperature: between 425-475º. That way, when you reheat them for about 15 minutes on a sheet pan just before serving, they don’t turn to mush. Stovetop vegetables: Look for recipes like this one for Green Bean and Tomato Saute that call for blanching the green beans in advance and finishing them on the stove in just a couple of minutes. We often make Green Beans and Balsamic Glazed Pearl Onions: not only does everyone love those sweet and sour baby onions and crisp beans, it can be made entirely ahead and reheated either on the stovetop or in the microwave in about 5 minutes. Brussels Sprouts with Bacon get reheated in a little broth on the stove. Okay, you did all your pre-cooking, and now it’s time to serve. Don’t scrounge through your cupboards and drawers searching for the right serving pieces– while all the food you worked so hard to make might overcook or get cold. The night before Thanksgiving, take out all your serving platters, bowls, and utensils, and mark a sticky note for each with the name of the dish for which they’ll be used. Seriously, this is a real time- and hassle-saver. Have a list on the counter of your entire menu. Sure, you know your menu– you’ve been living it for a couple of days. But your family is all around, people are talking to you and you’ve got a whole lot of food to get on the table. It is easy to forget to take the cranberry sauce out of the refrigerator or the vegetables from the microwave. And if you are anything like me, when you finally sit down, you would rather not have to bounce up again a bunch of times. It’s time to sit and enjoy the meal and your family. *everything that should be, that is. All Fab and spot on tips and procedures Marge! This year I’m adding a new one for me…a heated gravy server that I found on Amazon. Happy Thanksgiving to you and David and your family! Oh, interesting! I will go look it up. Have a great holiday, Ann. I hope you will post pics!